Marvel’s Agent of S.H.I.E.L.D. (Strategic Homeland Intervention Enforcement and Logistics Division) has just started its fifth season on ABC opening with an intriguing two-hour season premiere ending on a small cliffhanger. While the four previous seasons have all been on Earth (with an exception of a few episodes taking place on a different planet), Season Five seems to have a setup that will have majority of the episodes set on a space station run by the Kree. 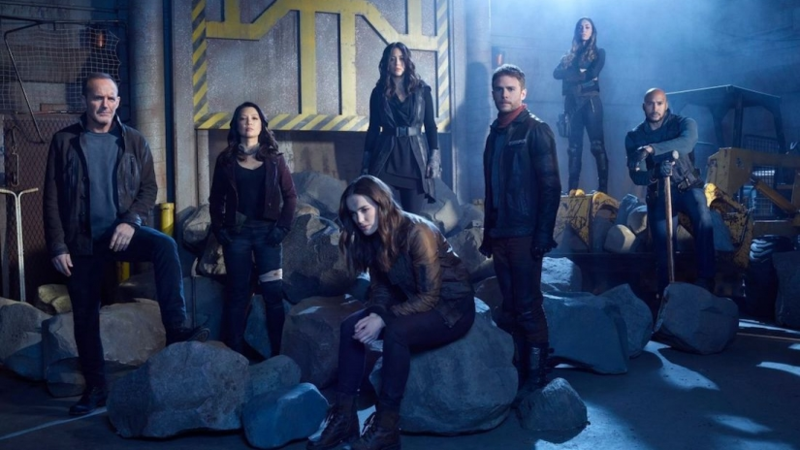 All of the agents except Leopold Fitz (Iain De Caestecker) are taken by an unknown group to a space station through a monolith similar to season three when the team went to Maveth through a monolith to save one of their agents. Each member arrives in a different part of the station and they quickly regroup to find out where they are and why. The team soon learns that the station is run by the Kree and inhabited by much more dangerous creatures called roaches. The Kree are a species of scientifically advanced aliens that made their first appearance in season 2 episode 12. Roaches are the other “inhabitants” on the space station where the agents are trapped. They are blue, like the Kree, but four legged, nearly impossible to kill, and was stopped once Agent Daisy Johnson (Chloe Bennet) used her powers to shatter the creature when it went after the other agents. After concluding that they are close enough to Earth for the Kree to launch an attack if they wanted, Agents Melinda May (Ming-Na Wen) and Jemma Simmons (Elizabeth Henstridge) get off the station for a brief enough time to see an Earth that is torn apart. Meanwhile, the other agents that are also gathering intel make the same connection, realizing the monolith sent them to a near future where the surface of Earth was no longer habitable to humans and infested with roaches. The two-part opening to the season ends with a cliffhanger as Agent Johnson confronts an ally the team has made named Deke, who has lived on the space station his whole life. She follows him to his own framework and confronts him on an Earth simulation where he reveals she caused the Earth to be torn apart, but as Tess told the agents before, everyone has their own story to explain what happened. Season Five takes a more serious approach to the current situation as the team is stuck in deep space with a group that S.H.I.E.L.D. has always been enemies with and humans that will go at each other’s throats for food. However, there are a few light and funny moments provided by Henry Simmons’ Agent Alphonso MacKenzie. The new season also includes callbacks and references to the two previous seasons with the mention of the monolith that sent the team to a planet with an unknown location, Maveth, Ghost Rider, and the framework. With the return of most the main cast members from the previous seasons, there hasn’t been an appearance yet by Iain De Caestecker’s Agent Fitz. His character was referenced a couple times, but wasn’t taken with the rest of the team either. However, his character will be in upcoming episodes as he got a note to the team saying that he was working on it. The first two episodes have a lot of action scenes despite having to set up where the team was, and why, along with introducing new characters and threats as they appeared. With the team surrounded by enemies, and down an agent, Season Five shows the team possibly facing their largest struggle against the Kree possible as they work to find their way back to their own time, save the people on the station, and survive by blending into their ways of survival.